PLAYING TOGETHER: Local 802 member Randy Sandke’s book uses the union’s archives to show that Local 802’s racial history was more progressive than most. 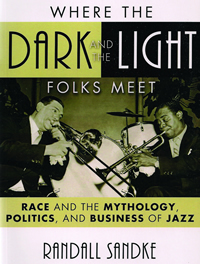 Pictured on the book cover are Louis Armstrong and Jack Teagarden. But admitting blacks and being responsive to their needs can be two different things. Though the information I gleaned was often spotty, it shows clearly and conclusively that, as far back as the 1930s, black elected officials played a significant role in Local 802’s affairs, and that the union took their concerns, as well as those of its African-American constituency, to be a serious and actionable matter. For instance, in March 1932, with the Depression deepening, there were attempts to lessen the pay of musicians performing in venues that catered principally to black clienteles. Management of the Apollo and Lafayette Theatres in Harlem, as well as the lesser-known Central and Republic Theatres, requested a 10 percent pay cut for its musicians to reflect declining revenues. Representatives of the Savoy Ballroom also produced signed statements by each member of its two orchestras saying they were willing to accept a decrease in pay to make up for operating deficits. But in all these cases, the union steadfastly refused to grant these requests. The musicians continued working, and with no loss in pay. A notice concerning weekend dances at Princeton University showed that the African-American bandleader Claude Hopkins received the same money as two white bandleaders: $1,400 for nine men, plus transportation expenses. In June 1932, the Nest and Saratoga clubs in Harlem were placed on the “unfair list” for paying their musicians below scale. The union agreed to further wage cuts in 1933 affecting musicians working in hotels and nightclubs, but was careful to concentrate on the most lucrative work, principally in midtown Manhattan. Also in 1933, Allegro noted that Lucius “Lucky” Millinder and his 12-piece band had been re-engaged at the Harlem Opera House, and all were receiving union scale. Meanwhile, Luis Russell, whose illustrious band often provided backing for Louis Armstrong, was owed back salary from Connie’s Inn, and so “Member Friedman is to make an appointment with Russell at Inn to collect same.” Apparently this intervention was successful, as there is no further mention of the incident. But in 1936, Connie Immerman (owner of Connie’s Inn) was brought before the Trial Board to answer charges of paying musicians under scale. At the meeting, Immerman claimed he merely lent his name to the establishment in exchange for a salary and share in the profits and was not responsible for its operation. The union responded by placing Connie’s Inn on the unfair list. 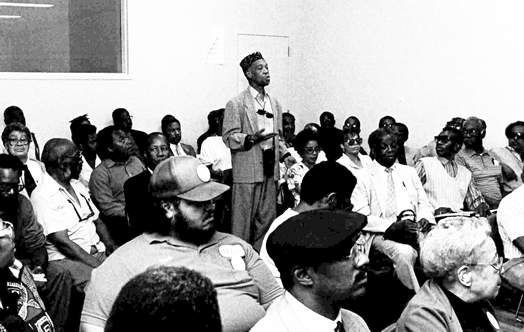 MORE HISTORY FROM OUR ARCHIVES: The trombonist Benny Powell addressing a meeting of musicians in New York City sometime in the late 1980’s. Powell was active in the union’s jazz campaign until his death in 2010 at the age of 80. In 1937, the union sponsored a charity ball at the Hotel Astor to help establish a permanent medical fund for members. The bands featured were an interracial galaxy of stars, including Cab Calloway, Don Albert, Benny Goodman, Woody Herman and Lucky Millinder. In later years, Local 802 hired some stellar African-American musicians when their careers fell on lean times. Former bandleaders Andy Kirk and Stanley “Fess” Williams both worked for Local 802 for long periods before their eventual retirement. The great trumpeter and arranger/composer Buck Clayton took a job there after he developed embouchure problems and before he formed his last acclaimed big band. Admittedly, such anecdotes and a few sketchy citations hardly provide a full and accurate picture of the complex and ever-changing racial dynamics within the music business in New York. But the yellowing pages of the Allegro archives clearly indicate a willingness to fight for better conditions and salaries for all musicians, regardless of color. Hindsight may make us wish the union had done more to level the playing field in certain areas, but the evidence shows that, by hiring blacks into positions of leadership, and listening to the concerns of all its members, Local 802 was an early and significant force in the struggle to achieve racial equality. Randy Sandke is a trumpeter who first joined Local 802 in 1974.